For more information about Adullam Teen Project, visit www.theadullam.org or call (509) 241-3182. At the age of 16, Caleb Altmeyer was angry. He ran away from home and his church. He fell in with the wrong group of friends. He started doing drugs and getting into trouble. It wasn’t until he was 18 that he realized he was headed down the wrong path and that he was never going to be a good father or husband someday. He said he wanted to change that. Now 24, he is looking back on that experience and trying to change young men’s lives in a positive way. He remembers looking up to older guys and wanting to be just like them, but they were the wrong sort of guys to emulate. About a year ago, he started the Adullam Teen Project, a safe place for 13- to 18-year-old boys to come for homework help, after-school activities and guidance from mentors. “Adullam” is a word from the Bible which means, “the refuge.” King David invited young men to the Cave of Adullam to prepare for battle. The organization now is at a house in Spokane Valley, which they are on a lease-to-purchase agreement. Altmeyer has found friends, youth group leaders, who come to live at the house full time. They all chip in to pay for the program. They also have mentors from church youth groups in the area come and help. There are from 10 to 12 boys who come Monday through Friday from 3 to 8 p.m. They are at-risk youths, those who haven’t been in a lot of trouble yet, but are headed that way. Parents of these kids often hear about Adullam through word of mouth. The house is a duplex that Altmeyer has plans to renovate to suit their purposes. In one half, there is a kitchen to make dinners, a living room with a television and video games, rooms where adult mentors live. Taylor Fyhrie, director of operations, said Adullam just received a donation of six computers and hope to turn one room into a tutoring and education room. On the other half of the duplex is a large meeting room where they discuss how to be a man through five areas: speech, conduct, faith, love and purity. Fyhrie said the group offers the teens a way to experience a normal life where they learn about respect and encouragement. While the plan is to expand into more areas, for now they are sticking with just boys because Altmeyer said it is hard to mentor a guy when there are girls around. “They’re going to try to act cool if the girls are around,” he said. Altmeyer said he and the other adult mentors communicate with mothers of the boys who visit. These mothers are often working two jobs and raising their children by themselves. He asks them what their children need to work on at home, as well as school. 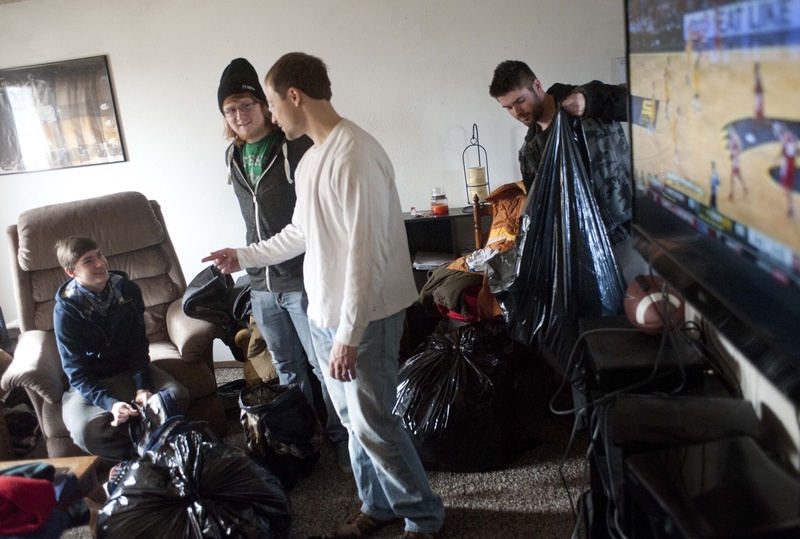 “Part of being a man is you’ve got to clean your room,” Altmeyer said he tells the boys. Fyhrie said they have been making connections with other programs, such as Operation Healthy Families, to develop programming. Youth pastors from nearby churches stop by once a week to talk to the boys. Right now, they are under the umbrella of another nonprofit organization in order to allow for tax-deductable donations. Altmeyer is working to get their own nonprofit, 501(c)3 status. Adullam moved into the house in October and the first thing the group did was get to know the neighbors. “We’ve had really good response,” Fyhrie said. They have had a “Rake and Run,” when two groups of boys raked yards and moved down the block, trying to see who could rake the most yards the fastest. They ended up collecting 2 tons of leaves in four hours. They’ve shoveled snow from driveways and walkways. Getting to know the neighbors helps Adullam, too. One night, some neighbors met a boy who was sleeping at a nearby park, burning trash to stay warm. They told him about Adullam house, where they took him in for the night. While the organization doesn’t offer overnight shelter, it found him housing through Teen Challenge the next day. On Saturdays, the boys participate in street outreach. They visit with the homeless in downtown, distribute sandwiches and offer hot cocoa. They have also made cards for local seniors in retirement communities and for members of the military. Since the program is still in its infancy, Altmeyer and Fyhrie said it was important for anyone who wants to help to visit the organization’s website and register for the group’s newsletter. Altmeyer said response so far has been positive. “The more people that hear about what we’re doing, want to get involved,” Altmeyer said.